On Saturday, September 13, Taylor and I went to Red Dog Diner in Lethbridge. The restaurant, styled after a Montreal-style deli, is locally owned and operated by a resident Quebecker known as “Le Boss”. The diner is located in the heart of downtown Lethbridge, offering a centralized location to many businesses, tourists and pedestrians. Red Dog Diner has a wide array of food, including a variety of poutines, steamed hot dogs, beef and chicken burgers, and soups. The food is prepared quickly, but not at the expense of being low quality. Both Taylor and I ordered the chicken burgers and were thrilled by the outcome. The chicken burger, unlike most food places, did not contain a chicken breast for the meat content, but rather, it was sliced deli-style and fried. The fries did not seem like typical out-of-the-box fast food fries, but appeared to be freshly cut. If you are looking for a unique diner experience and are headed to Lethbridge, check out Red Dog Diner. 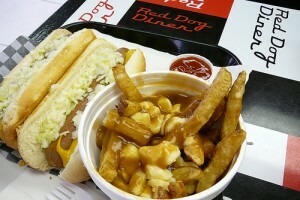 Red Dog Diner is located at 545 – 4th Avenue South in Lethbridge, Alberta. This entry was posted on Tuesday, September 15th, 2009 at 9:01 AM and is filed under Restaurants & Hospitality. You can follow any responses to this entry through the RSS 2.0 feed. You can leave a response, or trackback from your own site. They have the most authentic poutine in the West! I believe they have the cheese curds shipped in from Quebec, and if you’ve ever had this “squeeky cheese”, it’s what makes or breaks poutine! Oh my lawd, that looks gewd. What does this have to do with medicine hat… especially media in medicine hat. Robert: The relation is that Lethbridge, or anywhere in Southeast Alberta may be common destinations for people in Medicine Hat. I try to do stories every now and then about places outside of Medicine Hat’s city limits to expand the horizon for Medicine Hat Media. In the case for Red Dog Diner, I mentioned they have Poutine, and Jeff replied saying they have “The most authentic poutine in the west,” which may be of relevance to Hatters. @Robert – If you want to get literal like that, what does your comment, or what does your name have to do with Medicine Hat, especially media in Medicine Hat. Kind of makes me wonder if people actually visit other sites on the internet before stopping here and commenting. I think what Daniel is trying to say is the vast majority of websites on the internet cater to a large selection of topics not dependent on the name of the site. Take the Medicine Hat News website for example, 75% of the content on the site is not for Medicine Hat, it’s national or international news. And while it is news, it’s not Medicine Hat News, and what about the photo gallery section, tv times, or the blog section – those are not “News” sections. This is just a good example, but you will find the same thing on every site to some extent. In addition to what Vaughn pointed out, it would be both impractical and implausible to devote a site entirely to media exclusively in Medicine Hat. It is pretty common knowledge that media here is relatively limited and probably would barely provide enough content to justify maintaining a site such as this, not to mention it would be difficult to keep a reader interested. I would wager that pretty much anyone in this city would happily travel to Lethbridge or even Calgary to see a concert that wasn’t going to be in Medicine Hat. Since they would be there anyway, why not grab a bite to eat at one of the restaurants we have reviewed? It is all applicable if you can look at it from a more interdependant point of view. I think what everyone is really trying to say is that someone needs to bring authentic poutine to Medicine Hat! Sounds like a good idea, Jeff, and we can call it “The Official Red Dog Diner of Lethbridge… In Medicine Hat.” It’ll be a good way to market it. I know a couple people who got very bad poisoning food after eating at Red Dog in Lethbridge, I would think twice about eating here. Jack: You can get food poisoning from anywhere that doesn’t prepare their food properly. Maybe someone is new and never cooked before, or maybe not. I feel like garbage if I eat anywhere like McDonalds or Burger King, and I have read about cases where people have had bad experiences with those places, but that doesn’t stop a billion people going there every week.